I’m in love. With a bike. Sadly not the bike I currently have. Let me present to you the object of my affections, an electric bike called A2B. Many people said to me that I would just get more fit with this tour, and that yeah, I could probably do about 50 miles a day no problem. Well, it has transpired there is a problem, lots of them, they are called hills, and England is littered with them. I’m not unfit, but I’m not one of the steel-calved peddle pushers that keep overtaking me either. I’m an ambler by nature and every hill I have to dismount and push Polly and my luggage up the hill with cars passing stressfully by. I’m sweaty, panting and grimacing – not an advert for cycling. I’m sorry, I tried to like cycling, but I only like the flat or downhill bits. 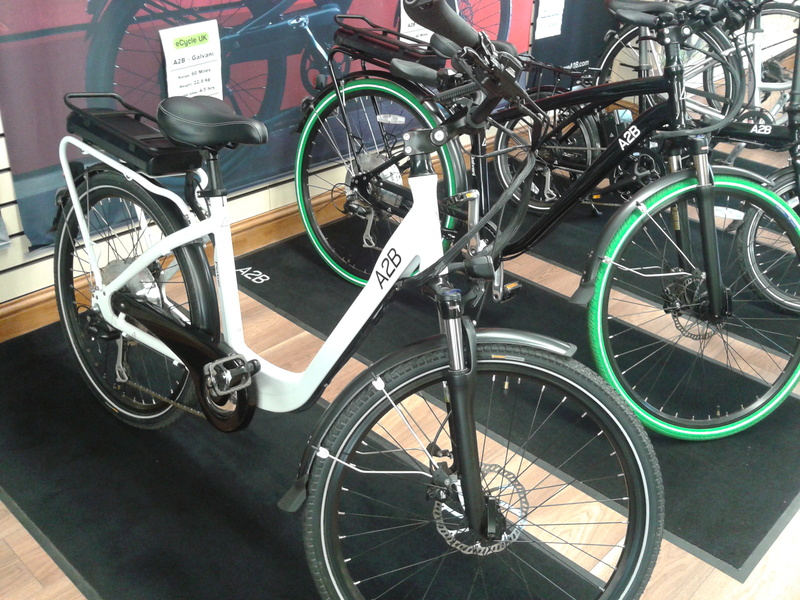 Then I visited eCycle in Stroud who sell electric bicycles, to get myself educated. Jacob didn’t bother with the hard sell, he just invited me to go for a test ride. “These things sell themselves,” he said smiling. Oh my gosh yes they do, but since you can’t try one right now I’ll try and explain. You still pedal on the bike but the battery assists you, so you fly up the hill, laughing gleefully. They’re not heavy like I expected and it looks like a normal bike. To charge it you just take the battery out and charge it up for a few hours from a normal plug and then it’ll last you about 60 miles. But you don’t have to have it on all the time either. I tried a couple of bikes but the relaxed touring style is definitely the one for me. I remember when the ipod came out and thinking “This is it, this is an invention which will really make my life easier then carrying all those tapes.” Well now I know what will be a viable alternative for me – this bike. Now I just have to cycle all around England on a normal bike, knowing full well what an electric bike feels like instead. Joy. This entry was posted in Transport and tagged bike, ecycle, electric bike, Jacob, Stroud, sustainable travel, transport, travel. Bookmark the permalink.